Franz Joseph HAYDN: Sonata No. 38 in F Major, Hob. XVI: 23 (1773); Sonata No. 43 in E-flat, Hob. XVI: 28 (1776); Sonata in C Major, Hob. XVI: 48 (1789); Adagio in F Major, Hob. XVII: 9 (1786); Andante con variazioni, Hob. XVII: 6 (1793). Bobby Mitchell (pno). Alpha 196 (1 CD) (http://www.outhere-music.com/). 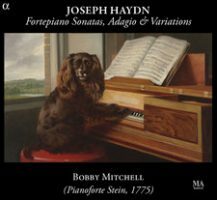 Exercising a Stein fortepiano from 1799, Mitchell improvises brief thematic and harmonic transitions between the sonatas and the concluding Adagio plus Variations sequence. It’s clear Mitchell enjoys this instrument: He plays with supreme sensitivity to how notes decay, how a phrase is heightened when it lightly echoes. These are mature Haydn sonatas, in which seemingly modest ideas are expertly probed. Mitchell plays with enthusiasm, coaxing drama and passion with rubato and dynamic shading. Franz Joseph HAYDN: Fantasia in C major, Hob. XVII: 4 (1789); Sonata in D major, Hob. XVI: 37 (1780); Sonata in E major, Hob. XVI: 31 (1776); Sonata in B minor, Hob. XVI: 32 (1776); Sonata in A-flat major, Hob. XVI: 46 (1768); Sonata in A major, Hob. XVI: 26 (1773); Capriccio “Acht Sauschneider müssen seyn,” Hob. XVII: 1 (1765). Francesco Corti (hpsi). Evidence EVCD031 (1 CD) (http://evidenceclassics.com/). Harpsichord may be unexpected, but not completely inappropriate. Corti’s tempos feel brisk, but this may be an illusion because the instrument resonates only slightly. I am not convinced by this David Ley harpsichord, a copy of a 1739 J.H. Gräbner. Fast passages do sparkle, as in the Fantasia. However, the main theme of the B-minor Sonata lacks punch. Haydn simply sounds wittier on piano. The A-major Sonata contains the Menuet al Rovescio which plays the same backwards and forwards. Corti supplies apt Haydnesque jokes in the closing Capriccio. 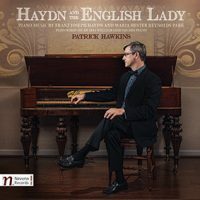 “Haydn and the English Lady.” Maria Hester Reynolds PARK: Two Sonatas for the Piano Forte or Harpsichord, Op. 4 (1795); A Waltz in E-flat major (1800); Sonata in C Major, Op. 7 (1796). Franz Joseph HAYDN: Sonata in D major, Hob. XVI: 51 (1794); Adagio in G major, Hob. XV: 22 (1794); Capriccio in G major, Hob. XVII: 1 (1765). Patrick Hawkins (pno). Navona NV5981 (1 CD) (http://www.navonarecords.com/). There are gaps in what we know about Haydn’s two London itineraries (1791-92 and 1794-95). It’s surmised that in 1794 he made the acquaintance of Thomas Park, an engraver whose prints had interested him. Consequently, he met Mr. Park’s wife, Maria Hester Reynolds (1760-1813), an accomplished keyboard performer and teacher. It’s been proposed that the D major Sonata, Hob. XVI: 51, was written for her. Hawkins provides three Park sonatas. There are two in Op. 4, and for symmetry, Hawkins has placed Park’s Andante Cantabile e Sostenuto, from Op. 2, No. 2, as a middle movement of Op. 4, No. 1. Park’s sonatas are polished and clear embodiments of the form, but they lack Haydn’s elegance and confident quirkiness. 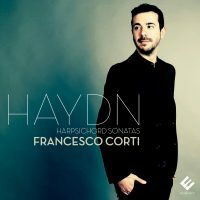 Haydn effortlessly introduces new ideas using different registers, rhythms and textures, a skill not as discernable in Park’s works. However, as companions to Haydn, Park’s sonatas are worth knowing, especially on this instrument, an 1831 William Geib square piano, whose 2013 restoration by Thomas Strange is detailed in the online notes. Franz Joseph HAYDN: The Seven Last Words of Christ on the Cross, Op. 51, Hob. III: 50-56 (1786-87; arr. ANON., 1787). Alexei Lubimov (pno). Zig-Zag Territoires ZZT341 (1 CD) (http://www.outhere-music.com/). On a wonderful tangent piano, Chris Maene’s replica of a 1794 Späth & Schmahl, a maker known and appreciated by Mozart, et al., here are eight pensive movements culminating in an earthquake. 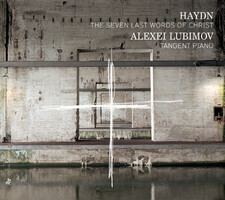 Haydn contemplated different editions of the Seven Last Words as he was writing it, creating the string quartet version himself, but allowing an anonymous transcriber to assemble the piano transcription. I find that this keyboard texture is far more expressive than many string quartet renditions I have heard, which astonishes, but perhaps it’s Lubimov’s handling of the slightly raspy, tinny keyboard. Its palette may be narrower than orchestra or quartet, but Lubimov plumbs a wide expressive range. 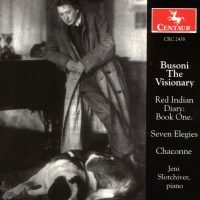 “Busoni the Visionary.” Ferruccio BUSONI: Red Indian Diary: Book One (1915); Seven Elegies (1907). J.S. BACH: Chaconne from Partita in D Minor for Solo Violin, BWV 1004 (1717-20; arr. BUSONI, 1893). Jeni Slotchiver (pno). Centaur CRC 2438 (1 CD) (http://www.centaurrecords.com/). Busoni cannot be a casual acquaintance. His music is involved and sprawling, he comments upon past giants as an equal editor, and he admits influences outside the mainstream. Bach was central to Busoni who produced numerous editions, arrangements and fantasies. Perhaps Busoni’s larger-than-life Bach translations are forgotten today, although he did find a way to transplant organ textures onto the 88 keys. When touching others’ music, Busoni could garrulously enhance. His elaboration of Schoenberg’s Op. 11, No. 2 is exactly this: The original piano piece is augmented with gestures and notes meant to emphasize perceived intent. Busoni had no problems with Schoenberg’s language or gestures, he just thought certain ideas needed more basting and expansion. And Busoni could be manic: The 1901-04 Piano Concerto overwhelms at 70-plus minutes, includes a swashbuckling tarantella, and requires a chorus in its fifth and final movement. If not to be bruised by the experience, Busoni requires a guide, and Slotchiver is just that. She has taken great pains to make Busoni comprehensible, and these releases contain immensely informative notes. Perhaps Vol. 2 may be the easiest to approach. I expect there will be more. Vol. 1 starts with “Four Studies on Motifs of the North-American Indians” in which Hopi, Cheyenne, Pima, Lagunas and Wabanakis tunes are treated as fertile source material for rhapsodies. The four studies could be perceived as a sonata. It is possible not to realize the source material given Busoni’s Romanticisms and pianistic filigree. If other composers such as MacDowell were influenced similarly, Busoni is ornerier and inclined to incorporate Lisztian splashes. As a group, the Seven Elegies are dreamy, bordering on gloom. In sequence, the pulse may slow despite background and foreground layering. Sometimes the turn to major is startling as in No. 2, All’Italia, when the clouds part to reveal a sunny Neapolitan scene. No. 4, Turandots Frauengemach, embeds “Greensleeves.” The more familiar Berceuse (No. 7) is pungent melancholy. The tone changes with the Bach Chaconne, one of Busoni’s more familiar piano transcriptions (even if programmed less frequently). Busoni exaggerates contrasts and underscores textures, as if the piano didn’t have enough of its own dramatic repertoire. 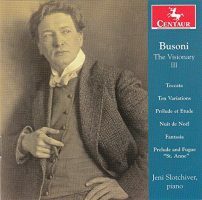 “Busoni the Visionary, Vol. 2.” Ferruccio BUSONI: Six Sonatinas: No. 1 (1910); No. 2, “Sonatina seconda” (1912); No. 3, “ad usum infantis” (1915); No. 4, “in diem nativitatis Christi MCMXVII” (1917); No. 5, “In Signo Joannis Sebastiani Magni” (1918); No. 6, “Kammer-Fantasie über Carmen” (1920). J.S. BACH: Toccata in C major, BWV 564 (1719-24; arr. BUSONI, 1899). Jeni Slotchiver (pno). Centaur CRC 2681 (1 CD) (http://www.centaurrecords.com/). For others, a Sonatina could be a small or trifling work. For Busoni, perhaps the idea is that his are compact. No. 1, which condenses music from an earlier series, An Die Jugend, is extroverted and varied. The expanded harmonies (a tonal harmonization over a theme in a different key) suggest Ives. If No. 1 is expansive and harmonious, No. 2 is intentionally dark and elusive, even demonic, and lacks straightforward time signatures (barlines are used to delineate phrases and line endings). The five-section No. 3 incorporates themes from the opera Arlecchino (1916). While the world was at war, Busoni threw himself into work and No. 4 was one of the results. Fiendish technique meets vivid piano writing to express complex yet fluid ideas. Imagine a sophisticated Ives written under the cloud of Dr. Faustus. No. 5 infuses Bach’s Fantasy and Fugue in D minor, BWV 905 with Busoni’s modernist language. No. 6 really is actually a rhapsody on themes of Bizet’s Carmen, a late-20th-century opera pastiche. Busoni’s ultra-Romantic treatment is complex and ends darkly. The Toccata transcription is rich and fluid, transporting organ to zippier piano. 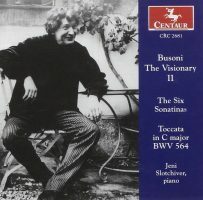 “Busoni the Visionary, Vol. 3.” Ferruccio BUSONI: Toccata (1920); Ten Variations on a Prelude of Chopin (1884; rev. 1922); Prélude et Étude (en Arpèges) (1923); Nuit de Noël (1908); Fantasia nach Johann Sebastian Bach (1909). J.S. BACH: Prelude and Triple Fugue in E-flat major for Organ, “St. Anne,” BWV 552 (1739; arr. BUSONI, 1890). Jeni Slotchiver (pno). Centaur CRC 3396 (1 CD) (http://www.centaurrecords.com/). The 1920 Toccata offers future and past all at once, a strange tonal and harmonic soup whose alternation of intensity and repose suggests an incredibly condensed Liszt Sonata. Cast in three sections (Prelude, Fantasia and Ciaccona), it could be orchestrated, however this speaks to Busoni’s intent to summon the piano’s full force. Prélude et Étude continues Busoni’s virtuosic exploration of expanded tonality. Nuit de Noël is a brief characteristic piece. The Variations are on Chopin’s Op. 28, No. 20, and Busoni exploits the chaconne-like nature of the funereal chord progression with startling enhancements and digressions. It is impossible not to be surprised when we turn the corner and see Chopin again. So much Busoni seems derived from Bach. This exploration was written in memory of the composer’s father, and works through several chorales (Christ, der du bist der helle Tag, BWV 766, Lob sei dem allmächtigen Gott, BWV 602, etc.). The St. Anne arrangement keeps to Bach’s original with sonorous octaves spread across the instrument’s range for timbral depth.